God is with me, but more, God is within me. Let me dwell for a moment on God’s life-giving presence in my body, in my mind, in my heart, as I sit here, right now. Father God, will I ever in this life be able to get comfortable knowing you are within me? In this mornings message we talked to the people about being intimate with you and as I sat here just a little while ago wondering what it means to be intimate with you. I think I have a fairly decent understanding of the word intimate I know in many circles it has a sexual meaning. But our intimacy goes far beyond physical intimacy, because you are Spirit and I am flesh. LORD, I know I could search the scriptures to discover the answers I seek but I would rather work it out between you and I. I want to forge my own meaning because isn’t that one of the characteristics of an intimate relationship. I think one of the most important factors when forging an intimate relationship not only with God but with anyone we either want to or feel the need to have an intimate relationship with it WHY. I have been in relationships that have only been one-way I give – they take. I suspect there are people who have sought to be intimate with God only for what’s in it for them. God gives – they take. I want my relationship with God to be two-way. God gives 100% – I take 100%. I give 100%– God takes 100%. I know that I’ll never be able to out give God but even though it is 100% – 100% – 100% – 100% relationship in intimate relationship no one keeps score. Father God, as I search and discover what it means to have an intimate relationship with you I know you’ll not hand it to me on a silver platter because it is out of seeking and discovering our relationship will become intimate one gold nugget as a time. And so I begin the adventure of an “eternal” life time. “Leave me here freely all alone In cell where never sunlight shone should no one ever speak to me This golden silence makes me free.” Part of a poem written by a prisoner at Dachau concentration camp. Silence is deadly. Silence is scary. Silence is a fertile field for listening. Silence is one way God communicates with us. Silence is one thing I am not sure about. Sometimes silence terrifies me other times silence is as they say golden. I have discovered that the world of silence is an entirely different world even though we never leave the world we occupy. It is different because it is a world of seeing, touching, smelling, tasting, and self-assessing. Silence is not for the faint hearted, nor is it for those who consider themselves self-reliant even though they keep running in to themselves. For me the world of silence is filled to overflowing with God. But it not just the quieting of noise that opens the gateway to the world of silence it is music of the spirit that opening the gateway. The music of the spirit is the sounds listened to with “ears of the spirit” that quiets and focuses the spirit on the presence of God. For me the music of the spirit is hymns and songs done instrumentally. I listen to Abiding Radio’s (click here) instrumental channel about 90% of the time when I am knocking at the gateway to the world of silence. To be conscious about something is to be aware of it. Dear Lord help me to remember that You gave me life. Thank you for the gift of life. Teach me to slow down, to be still and enjoy the pleasures created for me. To be aware of the beauty that surrounds me. The marvel of mountains, the calmness of lakes, the fragility of a flower petal. I need to remember that all these things come from you. I am an outdoors person. Having said that I am not an athlete the closest I get to an athletic event is a leisure bike ride. It’s just this simple – I love being outdoors because I have no trouble feeling God’s presence. Not only do I feel God’s presence outdoors but it is also easy for me to slow down and enjoy life and especially God. My favorite places to be outdoors are the Smoky Mountains around The Great Smoky Mountain National Park, and The Fort Gratiot Township Nature Trail, another favorite spot is at the mouth of Lake Huron in Port Huron, Michigan north of the Blue Water Bridge Complex connecting the United States and Canada. It boggles my mind when I hear or read of kids from inner city kids from big cities who have never been in the great outdoors outside their neighborhoods. It must be very hard to feel God’s presence when day after day people are surrounded by deteriorating tenements, poverty, crime, helplessness, hopelessness. Yet where do you think God would be, if not in places where the need is the greatest? I have a great deal of respect for ministers and churches who have a presence in the inner cities and especially those who bus kids out of the inner city to campgrounds where they are able to meet God and enjoy a world outside theirs. LORD God, I want to burn into my mind the images of the Smoky Mountains and your presence in each living thing, and I want to also burn in my mind the multiple images of inner cities and imagine your presence there as well. Thank you so much for the wonderful blessings that have been mine over the course of my life. –Amen! Mark 1:12-15… And the Spirit immediately drove him out into the wilderness. He was in the wilderness forty days, tempted by Satan; and he was with the wild beasts; and the angels waited on him. Now after John was arrested, Jesus came to Galilee, proclaiming the good news of God, and saying, “The time is fulfilled, and the kingdom of God has come near; repent, and believe in the good news”. The LORD’s prayer reads, “And do not bring us into temptation, but deliver us from the evil one.” (Matthew 6:13, LEB) Yet after his baptism the Spirit immediately drove Jesus out in the wilderness to be tempted, have you ever wondered why the LORD’s prayer asks not to be lead into temptation and yet Jesus had no choice but to go into temptation? I am wondering. Here’s one thought Jesus tells us to ask God we not be lead into temptation because he had first hand experience in temptation and didn’t wanted us to experience it. Here’s another thought the Spirit drove Jesus into the wilderness to build on his now human-to-God relationship and Satan showed up to try to come between them. (Jeremiah 29:11 NLT) Does that sound like God is in the business of pushing us into temptation? What it all means is this – in our every day life we face multiple temptations from a variety of sources fabricated by Satan the Tempter however in a real sense we too become a “minor tempter” because of a conflict of interests going on inside us stemming from our personal desires and God’s desires. I think if you stop to look between the lines in Job’s story you’ll see that Satan instigates a conflict deep inside Job which is further fueled by his friends. Meanwhile Satan sits back and enjoys his handiwork waiting to celebrate his victory only to lose in the end. For me in Matthew 6:13 Jesus is telling us to remain faithful to God in spite of the conflict of interests going on inside. Job’s story is a blow-by-blow testimony that whatever Satan starts God can and will send the Spirit not only to encourage us to hold on to our relationship with him but also put an end to it at just the right time. The Spirit (at God’s direction) drove Jesus into the wilderness where the only thing he could really depend on was his relationship with God the greater his dependence on God the deeper their intimacy grew until Jesus could do nothing apart from the Father. In my quest for a deeper intimacy with God I am discovering that truth, however my intimacy with God needs to stem from my need for God not for God’s blessings. Reading the scriptures for me is bittersweet. Bittersweet because there are times when I read them with the “mind and eyes of the Spirit” and they become alive and if find myself in them, and other times I find myself reading them with my own mind and eyes and all they become is a collection of words forming a sentence about some experience over 2000 years ago. My problem is I find the latter more prevalent then the former. Jesus, I know you speak to me through the Spirit and the scriptures. Back before 2009 you spoke to me through my imagination and now that happens less frequently can you tell me why that is? Was a time when I could write 3 or 4 Glory Seeds in a 10 hour shift at work and still get my daily duties done, now that I am retired with all kinds of time and it takes me about 90 minutes to write one and after that my mind and spirit go blank. I love to write fictional stories based on your interaction with people of your day for people of my day that has not happened in nearly 6 years. Why? 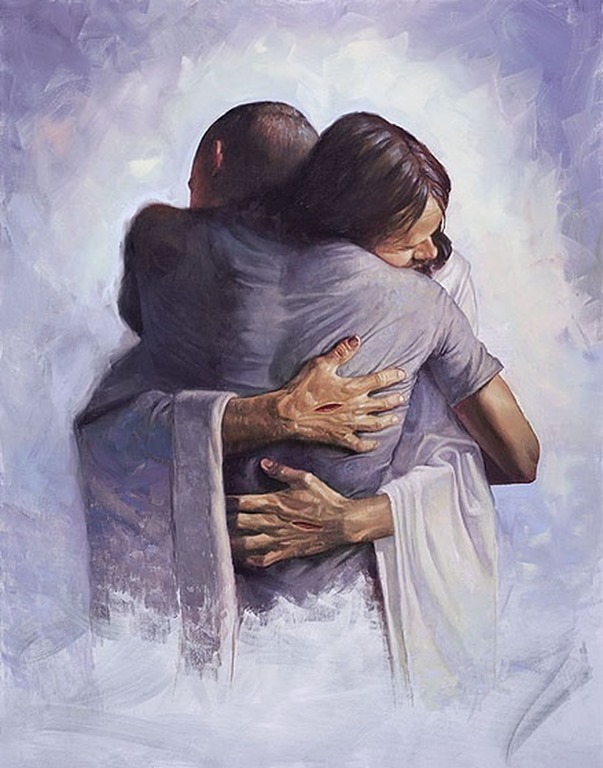 I love you so much Jesus and my greatest desire is to tell your story through stories that give reality to your desire for a relationship with all who come in contact with our writings. For example it has taken me 24 days to finish this. Glory be to the Father, and to the Son, and to the Holy Spirit, as it was in the beginning, is now and ever shall be, world without end. *** I can not say enough about my need to be a praying person. If somehow I could answer the command to pray without ceasing that would not be enough. Over the course of my life I have been an avid journal keeper with most of them being private. However, I have decided to create a Prayer Journal (items preceded by bullets) using material titled “Sacred Space Spirit Daily Prayer” which is a ministry from the joint apostolate of the Irish Jesuits and Loyola Press and it is with their permission I use their material. For more information or to utilize other wonderful material please click on the “Sacred Space” link above.